Transparency Thursday: Generic Drugs in the Developing World; Is Access to Quality Healthcare a “Human Right”? “The two companies that make vaccines against cervical cancer announced Thursday that they would cut their prices to the world’s poorest countries below $5 per dose, eventually making it possible for millions of girls to be protected against a major cancer killer. “The vaccines cost about $130 a dose in the United States, and each girl needs three doses. The lowest price that any other agency or government has negotiated, Dr. Berkley said, is the $13 paid by the Pan American Health Organization, which negotiates a bulk price for Latin American countries. “Dr. Julie Gerberding, a former director of the Centers for Disease Control and Prevention who is president of Merck’s vaccine division, said $4.50 was Merck’s manufacturing cost, with no previous research, marketing or other costs built in. “Dr. Berkley described the new prices as a ceiling, and said he expected them to go down as millions more doses were ordered and as rival vaccine makers from lower-cost countries like India and China entered the field. Other companies, including the Serum Institute of India, the world’s largest vaccine manufacturer, are developing papillomavirus vaccines, but at the moment only the Glaxo and Merck vaccines have approval from the World Health Organization. The alliance, Dr. Berkley said, has already negotiated sharp price drops in the cost of pentavalent vaccine, a shot that protects against diphtheria, tetanus, whooping cough, hepatitis B and Haemophilus influenzae B. The “spotlight effect” continues to be one of the main drivers influencing prescription drug maker’s decisions in the developing world. The Access to Medicine Index is one example of how much company’s value the goodwill they receive from socially conscious operations. A Google search of “pharmaceuticals CSR” (corporate social responsibility) yields results from many major pharmaceutical companies highlighting their work in the field. It is no secret that the Pharmaceutical industry, which is dominated by large multinational corporations, realizes very large profit margins. There is nothing wrong with large profit margins (despite what some may think based on the content of this website, I am a great supporter of capitalism and it’s self-perpetuating innovative mechanisms, as long as there are rules to make sure companies are not taking advantage of society as a whole in the name of maximizing shareholder earnings), as there are significant research and development costs associated with creating new medicines. On moral, ethical, and even economic grounds, it is difficult to defend companies not allowing developing countries to produce generic versions of their drugs. There is no loss of revenue for the drug companies; these people are not sitting on cash waiting for handouts, they would not be able to afford the drugs at a higher cost. Economics calls this “third degree price discrimination”; selling a good at a lower cost based on the realities of the targeted market. The goodwill and positive press these companies receive is just icing on the cake if pharmaceutical companies sell their drugs at cost (zero profits, but all costs are covered; financially it is a wash and in so many other ways beneficial). Essentially, the Indian Supreme Court ruled that in order for a drug to receive a renewed patent (and thereby disallowing generic version to be produced), a “true innovation” in the drug has to be proven. Simply changing proportions of minor ingredients, or repackaging an existing drug as something new, will not allow companies to get new patents. Some in the pharmaceutical industry have tried to protect their interests, saying this ruling will compromise their “ability to develop and manufacture innovative medicines.” I believe we will see the opposite effect. Companies, knowing they need truly innovative breakthroughs to receive new patents, will focus their efforts on creating these new drugs, instead of tinkering with existing drugs in hopes of extending their IP rights on drugs they have already greatly profited off of. What do you think? Certainly Pharmaceutical companies have reaped huge profit margins, and benefit from an implicit oligopoly (various barriers to entry make new Pharmaceutical companies almost non-existent). Is there a moral obligation for pharmaceutical comapnies to allow cheap generic alternatives to be produced for people in the developing world? Or is it just an act of charity when these companies do something socially responsible, but not something those in the developing world should count on? 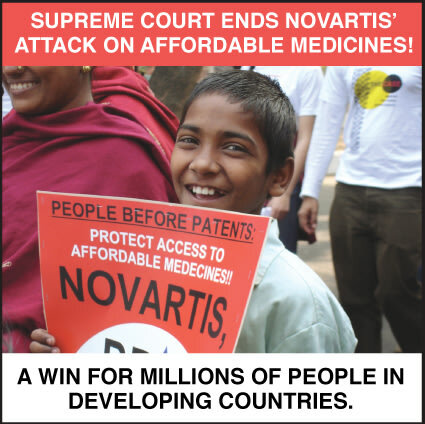 Or is it up to the legal systems in the developing world to stand up to vested interested, and uphold the right to access to affordable medicine for their citizens, as the Indian Supreme Court recently has done? Categories: Blog Posts, Transparency Report | Tags: Centers for Disease Control and Prevention, Developing World, Generic Drugs, Healthcare, Human Rights, intellectual property, IP rights, Least Developed Countries, Merck, moral obligation, profits, r & d, research and development, WHO, World Health Organization | Permalink.